I hunt because I enjoy eating venison. Some hunt looking for the big trophy whitetails and some like me, hunt for the meat. 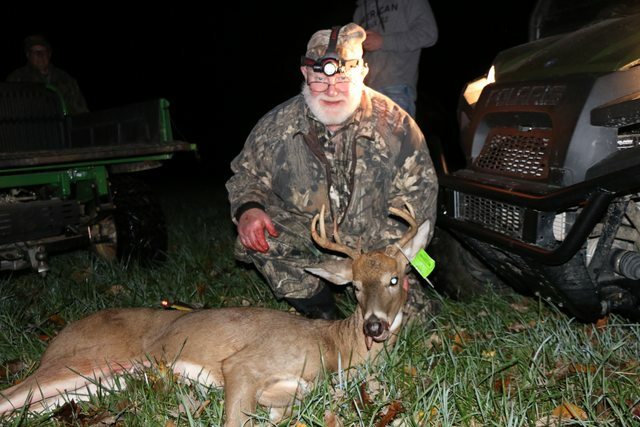 I got this buck on Wednesday night and I can guarantee you he is going to be a very good eater. I always hunted with a compound bow but as I got older and due to some previous injury it became very difficult to draw a compound bow. Two years ago I got back into bow hunting, after a 20 year hiatus, when I bought a cross bow. This was the first buck I have had in decent range and I was able to get a double lung shot on him. We did have to track him about 120 yards in the swamp. The blood trail was very sparse at the start but then got stronger as we continued. After we recovered him, we found why the blood trail was so sparse. The exit hole was blocked by a couple of tennis ball size blood clots and his abdominal cavity was full of blood. Thanks plant-one. How is your food plot doing? The night before I shot the buck I had a group of 3 Toms come out of the woods 10 yards from my blind. They went broadside in front of me. I was tempted but I don't have a license, so that was a no go. Then about half out later a group of 10 Toms came out of the swamp and went into the picked corn field. They were about a 100 yards off. It's kind of funny when turkey hunting you see all kinds of deer and when deer hunting you see all kinds of turkeys. Good luck in your quest to arrow one. That would be quite an accomplishment. Thom28 wrote: Thanks plant-one. How is your food plot doing? Probably not Toms, probably Jakes - wannabe Toms. Nope,all had long beards 8 to 10". They were all full grown Toms.